How do you create an innovative sourcing campaign? Do you want to learn the latest sourcing strategies? What are the top tech companies doing to source top talent successfully? Who has solved the sourcing problem? – Those who produce developer content. – Those who get referrals from trusted developer advisors. – Those with strategic partnerships and sponsorships. The biggest names in tech use a combination of long-term strategies. Branding, content marketing, and open-source projects. These are the strategies that bring candidates to them. That means recruiters at big tech firms aren’t spending time on LinkedIn. They are busy talking to candidates that came to them. Not the other way around. What if your company isn’t a well-known brand? Like most companies, you can’t rely on top talent finding you. What’s the exception? Finding the right sponsorships. Sponsorships bring talent to you. This is where bigger is better. Large enterprises can outspend competitors at conferences and other industry events. This is effective. Hundreds, or even thousands, of specialists, will recognize your brand as an ally. A company that understands their unique skillset. Someone that understands them. How much do sponsorships cost? If you have to ask, then it’s probably not for you. Conferences can have dozens of sponsors. An effective sponsorship means being the company that people remember. And that means being the top sponsor. Something that can cost 10X, or even 100X, more than lower level sponsorships. One problem is that most conferences only happen once per year. If you have the budget then you’ll want to find multiple events to sponsor. Tip: the savviest sponsors access to the event mailing list. This can help extend your reach throughout the year. It’s well known that referrals are the best way to source talent. It’s how leading companies stay ahead. Referrals are the #1 driver of successful hires at Google, according to Laszio Bock, the Head of Human Resources at Google. What is Google doing to get more referrals? It’s simple. They just ask! Did you know that Google “nudges” their employees multiple times per year to get referrals? And that works better than increasing the referral bonus! This method works for companies of all sizes. Who can you ask for a referral today? Recruiting agencies often host local meetups. That helps them connect with local talent. It’s costly, but, they recoup their investment from recruiting fees. Did you know that Google employs dozens of people just to contribute to the Angular open-source project? Because Angular brings them attention. That turns into more businesses using Google products. And, more importantly, more talent! Talk to your development team. Can they share something with the open-source community? Top companies get significant amounts of publicity from open-sourced projects. Open-source is like content marketing on steroids. When you have an open-source project then job applicants will already understand how your team writes code. And that’s long before the interview. You’ll also need to invest in marketing and project management to maximize the return on your open-source efforts. Like most people reading this, you’re not recruiting internally for a big consumer-facing tech firm. And your company doesn’t have the budget for premiere sponsorships at the top tech conferences? What do you do? 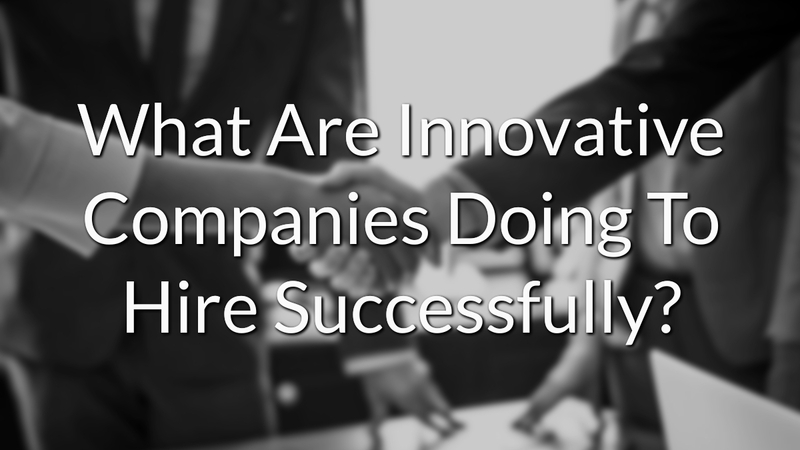 What are innovative recruiters doing to keep up? Innovative recruiters are specialists at finding new opportunities. Ways to reach candidates on new apps, social media, and growing websites. Step one is narrowing your focus. What is the special skill set of your target candidate? Then you need to find where people with those skills go. Where can you find people that are passionately learning about that specific skill? This is how top recruiters stay ahead. By far the best way to reach qualified candidates is by leveraging existing audiences. You can do this by partnering with conferences, newsletters, meetups, social media accounts, and other developer groups. The qualified candidates you need busy. It’s a lot of work being successful. These candidates are probably happy with their current role. And feel good about moving their company forward. You’ll find that these developers comprise most of the market you’re trying to reach. The advertising industry is actually light years beyond recruiting when it comes to technology. These tools enable advertisers to target people that had a frosted-blueberry-cinnamon-roll with coffee for breakfast. So why are you still keyword searching on LinkedIn? You too can utilize massive advertising networks to hire successfully.